High capacity vacuum for the garage or workshop. The Shop-Vac Professional Stainless Steel 12 Gallon Portable Vacuum is as functional as it is stylish. 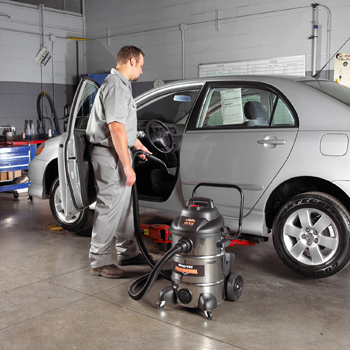 This high capacity, rolling wet-dry vac has a 6.5 peak horsepower, single stage motor. It has a convenient tank drain and onboard accessory storage. The Shop-Vac Professional Stainless Steel 12 Gallon Portable Vac is perfect for a home workshop or a professional garage. The single stage motor provides low sound level with considerable sealed pressure, also called water lift. Sealed pressure is the measure of how far a vacuum motor can life a column of water up a glass tube. At 60 inches, the Shop-Vac Stainless Steel 12 Gallon Vac offers plenty of power to clean up dirty garages and vehicles. Yet, the vacuum is surprisingly quiet. The Shop-Vac Professional Stainless Steel 12 Gallon Portable Vac has a 20 ft. power cord and 14 ft. hose that allow you to work around your vehicle with ease. The tank drain features means you never have to lift the vacuum to empty it of liquid. A squeegee insert allows you to dry a wet floor easily. Use the included floor brush attachment to clean up debris. The Lock-On hose can be removed and coiled up when not in use. The cord and accessories store onboard the vacuum. Add the Shop-Vac Professional Stainless Steel 12 Gallon Portable Vacuum to your garage. Griots Garage Carpet Cleaner 128 oz.